Under the slogan "Fukoku kyohei, Shokusan kogyo (Enrich the country and strengthen the military; encourage new industry)," Home Minister OKUBO Toshimichi strongly promoted a modernization campaign that prioritized domestic affairs and advocated that Japan should hold exhibitions to encourage the development of industries. This led to the National Industrial Exhibition. In the early days, the Museum was deeply linked to the exhibition. The first industrial exhibition was held in 1877 in Ueno Park and from then on it was decided that it should be held every five years. The first National Industrial Exhibition was held mainly in the brick art museum that was built at the site of the Kanei-ji temple main hall. The east and west main buildings were set up in symmetry and the venue was separated into six areas including machine, gardening and agricultural pavilions. The art museum that served as the main building of the exhibition is memorable as the first building to be called bijutsukan or art museum. The exhibition featured items from more than 16,000 contributors and attracted 450,000 visitors during the 102-day period. A steam locomotive was on display and a spinning machine invented by GAUN Tatsumune was a popular exhibit. The location map for the exhibition shows the tea-ceremony house Rokuso-an, that was contributed by the Museum Department and built behind the art museum. 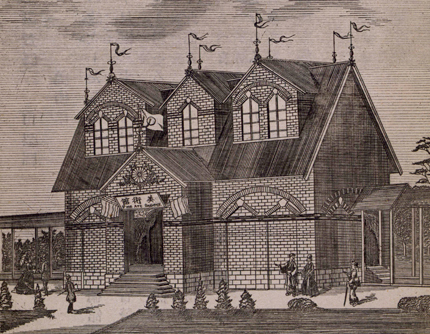 The second exhibition was held in 1881, again in Ueno Park. A part of the just-completed Museum's main building, designed by Josiah Conder, was used as the venue. The 122-day exhibition attracted 820,000 people. The gas street lamps introduced at the exhibition were said to have been very popular. It was in 1890 that the third exhibition was held, although it was originally planned to be held in 1885. The venue was Ueno Park, where a steam locomotive actually ran through. A brick two-story building that was built as a reference pavilion was handed over to the museum after the exhibition, to be used as Building No. 3. Two buildings located in the Takenodai area were also acquired and the museum used them as exhibition halls and rented them to art groups. The Fourth National Industrial Exhibition was held in Kyoto in 1895. 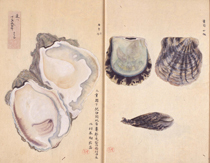 The fifth and last exhibition was held in Osaka in 1903. From the fourth exhibition onward, the museum distanced itself from the industrial exhibition and began to take a course of its own, separate from the government policy to encourage new industries.